I’ve been itchin’ recently for a mechanical project. As a woodworker, I’m a furniture man through and through. Sometimes a father just gotta put some flames on his boy’s new set of wheels. It’s a balance bike, or as I will call it now, a suicide trike. The physics (and teaching) of bicycles holds the key to a balance bike. Bicycles stay upright and balanced not because of the movements of the rider (though they are a factor) but by the motion of the wheels. The spinning wheels act like a gyroscope and naturally want to spin upright – the wheel essentially creates its own gravitational force. The faster you go, the more stable a bicycle (or motorcycle) becomes. That’s why it’s harder to control a bike going slow than a bike going fast. So why put extra wheels on a bike during a kid’s formative years? To stop him or her from crashing at slow speed of course! The training wheels, instead of promoting balance, promote a kid to lean over the bike for stability. The training wheels train a kid to ride the bike the wrong way because he or she isn’t strong enough to get it up to speed while pedaling. 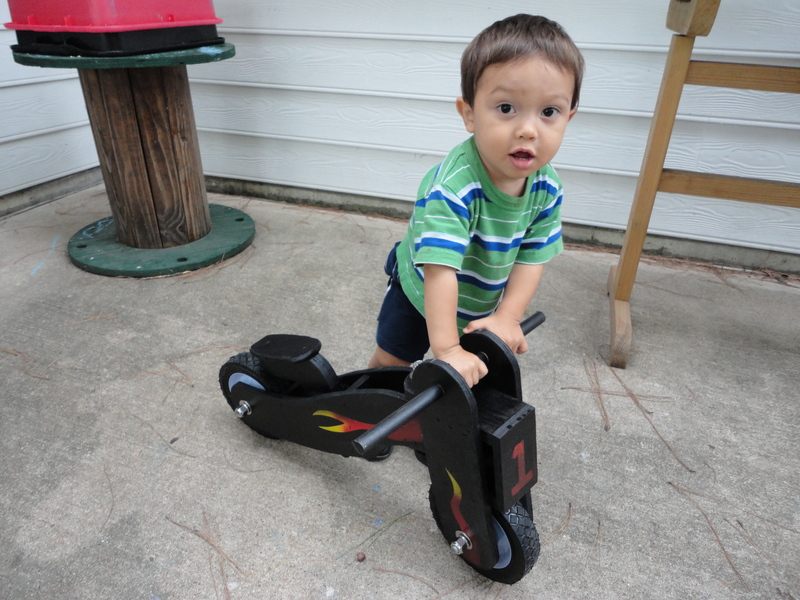 A balance bike lowers the center of gravity, removes the pedals and teaches a kid to ride upright. When the kid gets up to speed, the bike stays up! The transition to pedaling happens at a more natural age (six to eight) and is easier because the kid has already learned to balance. They only need to learn to pedal now. Or so they say. My eldest took one look at the thing and decided to ride his mother’s choice, this contraption. His loss. The little one likes it. The build went surprisingly quick. I used a compass and french curves to layout one side of the frame on 1/2″ plywood and cut two blanks. I taped the blanks together and cut them out on a bandsaw. I kept the pieces taped together, drilled 1/2″ holes for the axle rod and then sanded the edges smooth with a drum sanding bit attached to my drill press. I used a similar process to cut out the forks (adding a 3/4″ hole for the handlebars) and the top and bottom of the stem. I cut a number of 2″ spacers for the body (a little wider than the wheels) and nailed the spacers in with pin nails. A few strips of 3/4 inch plywood made a suitable stem in the frame. A 3″ x 4″ piece of 1/2″ plywood made the nameplate and stiffened up the front end assembly. Another couple of quick curves and work on the bandsaw netted me a seat assembly. The seat is rather narrow looking, but my sons found a wider seat (I originally made it look like the Harley saddle seats from the days of yore) uncomfortable. Eventually I will install a red suede cushion there. Then I glued and nailed the piece together with an air nailer and dry fitted the wheels and stem. I used 1/2″ threaded rod throughout and 7″ lawnmower wheels for movement. The wheels had a 1/2″ arbor (lucky me!). Some steel spacers cut to length completed the axle. Off to the “painting booth”. A sprayed coat of black acrylic to start with. Then I masked off some flames and a number 1 for the faceplate. A quick shot with my airbrush (first time using it too!) and had myself some suitable flames. I reassembled and presented it to my boys while humming “Born to Be Wild”. They didn’t get the joke. I’m working on making this project an Instructable for http://www.instructables.com and will soon have a Sketch Up model in the Warehouse. Check back for updates. Make it safe & keep the rubberside down this week. If you enjoyed this project, why don’t you show your support for this blog by liking WoodshopCowboy on Facebook? At thirty likes, I’ll send the winner a genuine Simple Tea Box.